One of just 80 space flown Apollo 17 Robbins medals has sold for $38,837 at an auction in the US, beating its $35,000 estimate by 10.9%. The medal, which flew on the 1972 mission - the last of the Moon landings - once resided in the collection of Apollo 17 commander Gene Cernan, the last person to leave the Moon's surface. 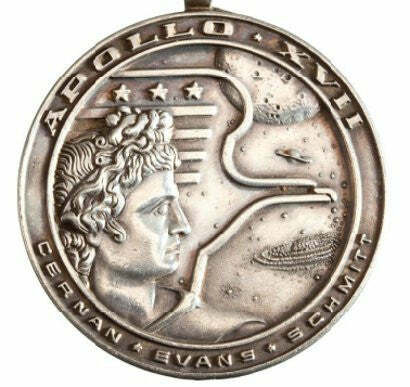 Another of the 80 medals from the Apollo 17 mission sold for $26,290 in March 2008, which represents a 9.82% pa rise in value, an indication of the upward mobility of the space memorabilia market. The latest sale was no doubt boosted by a letter of provenance from Cernan, which stated: "I hereby certify and confirm that silver Apollo XVII Robbins medallion, serial # 73, was flown to the moon and remained in lunar orbit aboard the Command Module 'America' during the mission, December 7-19, 1972". PFC Auctions is currently auctioning a US flag signed by Cernan, fellow moonwalker Neil Armstrong, and Jim Lovell, the commander of the Apollo 13 mission. A space flown Apollo 11 Robbins medal, originally from the family of Skylab 4 astronaut Gerald Carr, made $31,070 at the auction, a figure matched by an Apollo 16 space-flown Robbins medal. A command module flight director attitude indicator, made in 1966 for the Apollo space programme but never used in space, sold for $65,725, while a complete Sokol KV-2 spacesuit, thought to have been used in training, achieved $21,510. Paul Fraser Collectibles has a training suit worn and signed by Buzz Aldrin currently available for sale. Two further Apollo 11 Robbins medals will auction on May 23. We will bring you the results.